It is sad that the economy is likely to experience a lot of negatives. The strategies by the business community against the adjustment of interest rates upwards on loans earlier granted is a case in point, as the business people have decided to counter the move by withdrawing money from the banks as well as closing their businesses. All the problems we are currently experiencing are blame able on the strategy made by the NRM to see that Museveni does not lose the 2011 election which saw billions of money put into, which is greatly responsible for the messed up economic situation, the constantly depreciating currency, the unreliable power; which situations are leading to increasing prices and a vicious circle of depreciating currency. It is equally unfortunate that Government sent Mbabazi to talk to the business community members over the situation. The fact is, Mbabazi has no credibility any more however much Government may wish that he plays a role. Mbabazi was required to leave office as investigations take shape, but he believes he is untouchable, this development is unfortunate. Not much can be done to save the economy as of now. Kampala City Traders Association (Kacita) leadership yesterday boycotted a meeting called by Prime Minister Amama Mbabazi to find ways to avert today’s planned strike over high interest rates on bank loans. The leaders said the meeting would not be of any help since government has showed no commitment to intervene positively in the matter. Kacita chairperson Evarest Kayondo and spokesperson Issa Ssekitto said they would not attend the meeting at Postal Building since they wanted Mak action, not “empty promises”. Only the organisation’s chief executive officer, Mr Moses Kalule, put in a token appearance and insisted after the meeting ended at 8:30 pm that the traders’ strike was still on. “We have talked enough and we feel we are exhausted. We are here in town briefing people not to open their shops for three days. Those that will come to town should just come to withdraw their money from banks,” Mr Ssekitto told Daily Monitor yesterday. The State Minister for Finance (General Duties), Mr Fred Omach, chaired yesterday’s meeting. It was attended by State Minister for Trade David Wakikona, the Governor Bank of Uganda, Prof. Tumusiime Mutebile, Private Sector Foundation boss, Moses Ogwal and bankers. The Prime Minister, Mr Amama Mbabazi, who joined in much later, told journalists, who were initially denied access, to the meeting that there was a proposal to review accounts of borrowers by extending the period of recovery of the loans but not reducing the interest rates. “We shall negotiate with banks to extend the period of recovery,” Mr Mbabazi said. 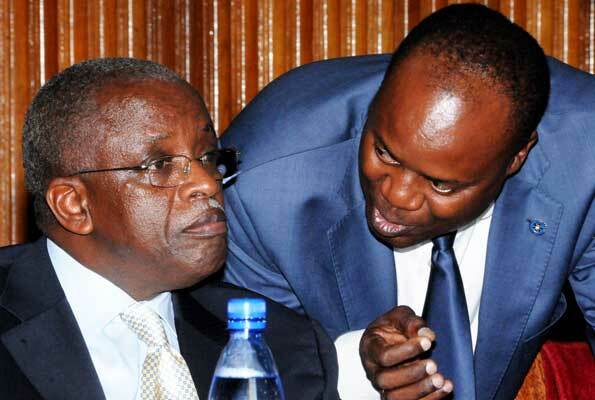 Bankers’ representatives meanwhile, handed the baton to the Central Bank, saying they were ready to decrease interest rates if it agrees to reduce the Central Banking Rate (the interest commercial banks pay when they borrow from BoU) which is currently 23 per cent. But BoU insisted that they cannot reduce the CBR abruptly as it is helping to reduce the inflation rate in the country, which is reportedly hovering at 27 per cent. So far, the traders have been joined by manufacturers, the private sector, teachers and now Makerere University staff all of whom are protesting the increased interest rates on old loans. They are all agreed that the new and much higher interest rates should not apply to old loans as this is exploitative. “Since the eight-hour (Monday) meeting in Parliament yielded nothing, let us stay at home because our businesses have already closed and there is nothing to do in town,” Mr Ssekitto said.